AFRICAN-AMERICANS constitute 26 percent of Alabama's people, but they accounted for 29 percent of the voters in this month's special election for the US Senate. Whites make up 69 percent of the state's population, yet they were only 66 percent of those who voted. Black voters, in other words, punched above their weight on Election Day, turning up at the polls at a rate that exceeded their share of the general public. Whites, by contrast, underperformed. But surely that's impossible! Haven't we been told time and again that Deep Red states like Alabama engage in voter suppression, cynically disenfranchising minorities through outrageous election rules that, as Jay Michaelson wrote in The Daily Beast, "just coincidentally happen to disproportionately hit communities of color"? Weren't we reminded in the weeks leading up to the election that Alabama's rules amount to "a naked attempt to suppress the voting rights of people of color" and that black electoral clout is undermined by all the hurdles the state's Republican politicians have devised to deter minorities from casting ballots? What angry critics decry as voter suppression, Republicans defend as precautions to ensure the integrity of elections. In Alabama, as in many other states, voters are required to show a photo ID. There is no same-day registration and no early voting, and citizens with convictions for felonies of "moral turpitude" are barred from participating in elections. Are these outrageous infringements on a core American right — or are they reasonable safeguards of that right? There are sincere arguments on both sides. But there's plenty of cynicism on both sides, too. Voter fraud, rampant in earlier eras, is essentially a nonissue in contemporary America; states without voter ID laws seem to have no trouble conducting fair elections. GOP lawmakers have sometimes admitted that there is a racial and partisan component to their support for such measures: The lack of an ID law, an Alabama state senator once confided in an interview, "is very beneficial to the black power structure and the rest of the Democrats." On the other hand, voter ID laws are extremely popular across the political, racial, and geographic spectrum. In a 2016 Gallup poll, 63 percent of Democrats supported voter ID laws. So did 77 percent of nonwhites. So did large majorities in every region of the country. To denounce voter ID laws as racist abominations when nonwhite voters favor those laws as overwhelmingly as white voters do is more than a little disingenuous. It's also condescending. For most of American history, black citizens really were disenfranchised, excluded from elections by violence and intimidation, humiliating "literacy" tests, and defiantly segregationist politicians. If anyone has reason to value the right to vote, it is African-Americans. For people with historical memories of Bull Connor and the Freedom Summer martyrs, having to show an ID when voting is a trivial detail, not "disenfranchisement." And that is just what the data show. Far from being suppressed, black voters routinely show up on Election Day at roughly the same rate as white voters. And — as with any other voting bloc — when they are especially motivated, they turn out at even higher rates. One such motivation was Barack Obama's 2012 reelection, which so energized black voters that their turnout not only hit an all-time high, but surpassed white turnout by 2.1 percentage points. Another motivation was this month's race in Alabama, and the exceptionally distasteful candidacy of Roy Moore. 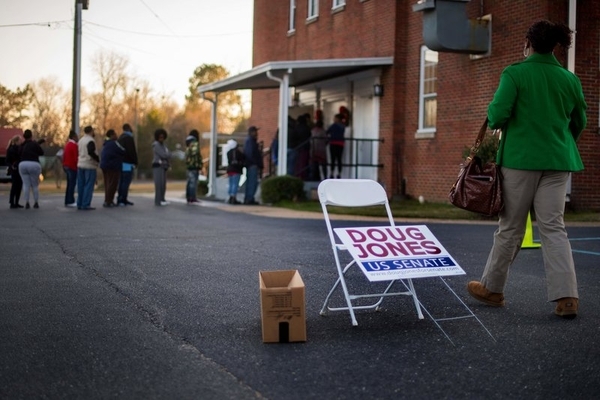 Alabama's election rules, bewailed by so many as an obstacle to minority turnout, didn't keep black voters from flocking to the polls. Nor have similar rules elsewhere. Even in Republican-dominated states with voter ID laws, black turnout has risen. When the Wall Street Journal's Jason Riley made that claim in a 2014 column, PolitiFact put it under the microscope — and confirmed its accuracy: "Census data shows that . . . black voter turnout was higher nationally than white voter turnout," the fact-checkers concluded, "and at least as high in the states with strict voter ID laws." 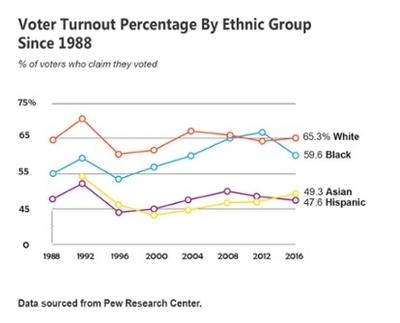 In recent decades, turnout rates for black and white voters have fluctuated within a few percentage points of each other. This doesn't mean that Republicans who champion such laws don't expect them to yield political dividends. It only means that voter suppression is more of a bugaboo than a real phenomenon. At the same time, that very bugaboo may be helping Democrats. The louder they howl about Republican attempts to keep minorities from voting, the more fervently their base may be galvanized to get to the polls. That too helps explain why ballot-integrity laws haven't impeded black voter turnout. To repeat, politics is a cynic's game. Republican strategists push for voter ID rules for the same reason Democratic strategists push for automatically registering people to vote when they sign up for welfare benefits or a driver's license: Each camp believes it will work to their party's benefit. Ultimately, though, elections come down to voters, who have minds of their own and routinely upset the experts' calculations. Alabama is only the latest reminder that when elections are free and fair, outcomes aren't guaranteed. In the Heart of Dixie, as in the rest of 21st-century America, voter suppression is a thing of the past.